"Positive only" dog training has become popular nowadays. With "positive only" dog training, you bribe your dog to do something with food or a toy. If he does the desired behavior, he receives the reward. "Positive only" dog training often includes a clicker device – a little metal tab that makes a clicking sound when pressed with your thumb. Clicker training is a form of "conditioning." 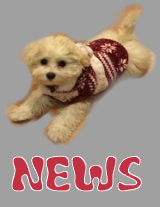 You click at the precise instant your dog is doing some desired behavior, then immediately give a treat. The dog learns that whenever he hears the clicking sound, whatever behavior he was doing at that instant will bring him food. Positive-only dog training and clicker training work well for teaching fun things – like tricks – where it really doesn't matter whether your dog obeys or not. If you tell him to shake hands or roll over and he doesn't do it, who cares? ....and for teaching your dog all the other behaviors you want a well-behaved family dog to do (or not do!).... positive-only dog training is less effective. Think about it. What happens when you want your dog to stop chasing a cat and come to you – but at that particular moment he's not hungry and would rather chase the cat rather than munch on a biscuit? Owners who rely on positive-only dog training are stuck whenever their dog "isn't in the mood" to do something. An old trainer once said that if a dog really wants to chase a cat, he will chase it "regardless of biscuits showering upon him like manna from heaven." Positive-only dog training does not teach your dog to respect you. And it is RESPECT that motivates a dog to be well-behaved even at times when he doesn't feel like it. Respect Training is a balanced philosophy of dog training. "Balanced" means both positive and negative consequences for one's behaviors. Real life for all living creatures consists of learning from both positive and negative consequences. Positive consequences encourage us to repeat a behavior. Negative consequences discourage us from repeating a behavior. For example, we hold the door open and someone says, "Thank you!" (positive), so we are likely to do it again. We take an extra-long lunch break and the boss docks our pay (negative), so we are less likely to do that again. We learn from both positive and negative consequences and behave accordingly. Your dog learns from both positive and negative consequences. Momma Dog will let Puppy know if he is playing reasonably or if he gets too rough. So do dogs. 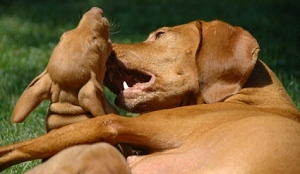 When a puppy plays with his mother, if his style of play is reasonable, she responds in a positive manner. But if he gets too rough, she is quick to correct with a growl. Does Puppy become depressed and never play with another dog again? Of course not. He is happy to play – only more gently. Dogs learn best from balanced dog training, where their behaviors can result in positive OR negative consequences. Positive consequences means you reward desirable behaviors with praise, smiles, petting, games, and yes, treats. Negative consequences means you correct undesirable behaviors with your voice, your facial expression, your body language, your hands, or with the leash or collar. Now I don't mean hitting, yelling, choke collars, or shock collars. I can show you how to correct your dog without being harsh or hurtful. Be realistic and fair with your dog. Show him positive and negative consequences so he can make an informed choice. 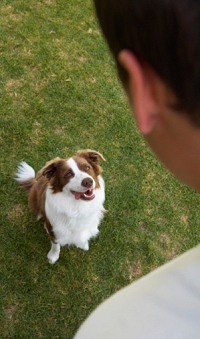 By showing your dog both positive and negative consequences, he can make a conscious choice to do a behavior (or stop doing a behavior) – not only when he's in the mood for a reward/treat, but also when he might not care a hoot about the reward/treat but he still controls himself because he doesn't want a correction. All of life works this way – "cause and effect." When YOU become the arbiter of your dog's behaviors – the one who gets to say yea or nay about what he's allowed to do – your dog feels respectful toward you. And once your dog respects you, he will listen to you. He will pay attention to you. He will do whatever you ask, and stop any misbehavior upon a single word from you. You might like my article on Respect Training. Or just follow the complete, step-by-step Respect Training program in my book, Teach Your Dog 100 English Words. You can download it and start reading immediately, or you can have the printed book mailed to you.